ola riders! 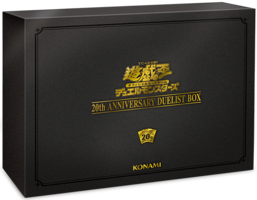 Estamos começando os reviews do mais novo set especial chamado 20th Anniversary Duelist Box! estamos analisando nessa semana os novos suportes pra deck Performapal !!! LETS GO! You can also Tribute Summon this card by Tributing only 1 Level 5 or higher monster. You can only use this card name’s (2) effect once per turn. (1) If this card is Tribute Summoned: You can destroy 1 monster your opponent controls, and if you do, inflict damage to your opponent equal to that monster’s original ATK. (2) When this card destroys a monster by battle: You can special Summon 1 Level 5 or higher monster from your hand or GY in Defense Position, except “Odd-Eyes Advance Dragon”. comentários: aceita 1 tributo de monstro lv5 como formula alternativa de summon. tem um triguer efeito de remoção com burn damage. além disso, quando ele destrói em batalha, ativa efeito de grave summon. INTERESSANTE! Pendulum Effect: You can use the [(1)st] Pendulum Effect with this card’s name only once per turn. (1) If a monster(s) you control whose current ATK is higher than its original ATK is destroyed by battle or card effect: You can Special Summon this card from your Pendulum Zone. 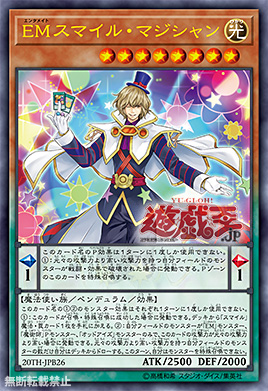 (1) If this card is Normal or Special Summoned: You can add 1 “Smile” Spell/Trap from your Deck to your hand. 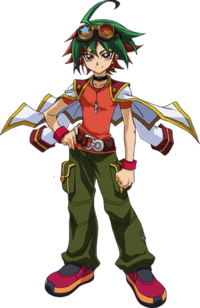 (2) If all monsters you control are “Performapal” monsters, “Magician” Pendulum Monsters, and/or “Odd-Eyes” monsters (min. 1), and this card’s current ATK is higher than its original ATK: You can activate this effect; for the rest of this turn, you cannot Special Summon monsters, also draw 1 card for each monster you control whose current ATK is higher than its original ATK. comentários: Spell continuo. muda level das pendulum scales. a carta aceita pendulum counters. os P counters dao boost de ataque aos monstro do campo. ao custo de 3 P counters, vc pode realizar 2 pendulum summons per turn! MUITO BACANA!